IT and Internet Services: establishing, equipping and managing an IT and Internet center under the supervision of the responsible sectoral side. Balanced Scaling Service: establishing, equipping and managing the balanced scales in the crossing point under the supervision of the responsible sectoral side. Testing machines Service: establishing, equipping, managing and maintaining the testing Sonar machines, persons and luggage testing machines and the radiological testing machines after obtaining the sectoral side approval and supervision. Motel and Hotel Services: establishing, equipping and managing a motel to provide its services to the visiting passengers. Restaurants and Booths: establishing, equipping and managing restaurants and booths within the crossing point that can provide regular meals, snacks and soft drinks. Testing Services: (K9) establishing, equipping and managing a testing service (K9) in the crossing points under the supervision of the sectoral side and includes testing explosives and drugs. Storing Services: establishing, equipping and managing cooled and non- cooled stores for all specialized departments in the crossing point (Food and equipments, Agricultural quarantine, veterinary quarantine, and medical quarantine). Shaded waiting areas: Establishing parking areas for vehicles, buses and trucks according to the international standards. Rest houses Service: establishing, equipping and managing rest houses within the crossing point. Water Desalination Station: establishing, equipping and maintaining water desalination stations within the crossing point. Power and Water Supply Services: the investing side shall be in charge of establishing power generation stations and water supply stations. Control System: establishing, equipping and maintaining a control system to be provided with the latest cameras and surveillance devices from the latest international sources. 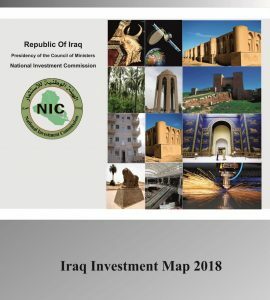 The point entrances: establishing, equipping and maintaining 4 entrances, 2 in the Iraqi side and 2 in the other side. Electrical Gates: establishing, equipping and maintaining developed electrical gates provided with Sonar machines, balanced scales and biometric reading machine. The crossing point buildings: establishing, equipping and furnishing special buildings for the crossing point departments and other depts. operating in the point area in addition to establishing halls for sleep. Mosque: establishing, equipping and furnishing a mosque with modern specifications. 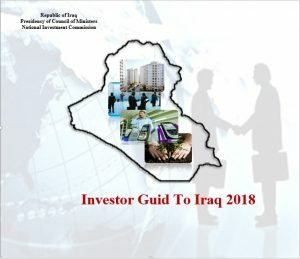 Investors willing to invest in the aforementioned investment opportunities are required to submit a detailed offer with the feasablity study at the headquarter of the National investment Commission or the headquarter of the Crossing Points commission, knowing that the closing date is 31.01.2018.